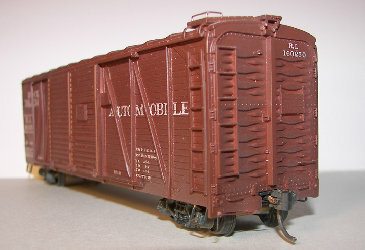 These kits represent 40’ automobile box cars that were built by the Bettendorf Company in 1930 and lasted in some numbers until 1959 with the 160250 to 160599 series cars (totaling 350 cars) built with end doors. The other series 159250 to 159899 (totaling 650 cars) had fixed ends. 400 of these cars had the roof raised 6” in 1946 and the door width increased by 2’6” to 14’6”. These cars are in the number series 159250 to 159899. The exact numbers are not available at this time. The car kits come with all detail parts needed to build kit with the highlights of one piece roof , One piece sides with door casting and door rails being separate for the none molded on look, both KC and AB type brake equipment, Trucks, Decals. The only thing the customer has to provide is paint, couplers and time. Pricing for RI-1 and RI-2 is $37.00 plus $5.00 for shipping and handling.